The United States Congress designated the Flatside Wilderness (map) in 1984 and it now has a total of 10,181 acres. All of this wilderness is located in Arkansas and is managed by the Forest Service. 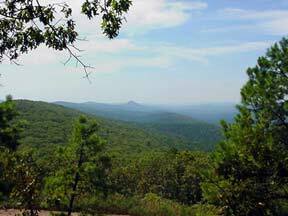 In the extreme eastern Ouachita Mountains is a Wilderness that takes its name from Flatside Pinnacle, a 1,550-foot rock outcropping just outside the northeast boundary. In 2019, the Wilderness was expanded and the added acres named the Bethune Woods-Flatside Wilderness addition in honor of former Representative Ed Bethune. Dominating the skyline are White Oak Mountain, the highest point in the Wilderness at 1,650 feet, and Forked Mountain, at 1,350 feet. From overlooks on the eastern and western sides, the forest below looks like an unbroken canopy of pines and hardwoods. Several small creeks flow through the area. Spanning the entire Ouachita National Forest from east to west, the Ouachita National Recreation Trail starts near Flatside Pinnacle and crosses the Wilderness for 10 miles of rugged hiking to White Oak Mountain. Off-trail hikers will encounter some of the remotest parts of Arkansas. Planning to Visit the Flatside Wilderness? How to follow the seven standard Leave No Trace principles differs in different parts of the country (desert vs. Rocky Mountains). Click on any of the principles listed below to learn more about how they apply in the Flatside Wilderness.